As I mentioned before my trip, the Scrovegni Chapel (or Arena Chapel) was commissioned by Enrico Scrovegni in 1300 as a funerary church for his family. He hired Giotto di Bondone at the height of this artistic career to fresco the entire interior of the chapel with scenes from the lives of Mary and Jesus. 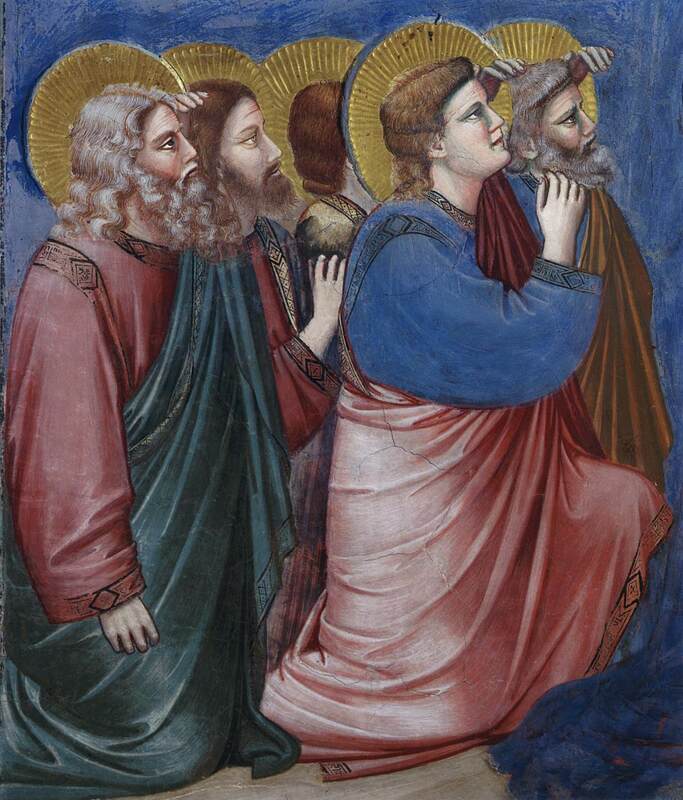 Giotto was a talented and innovative artist who broke away from the Gothic style prevalent at the time. The Scrovegni Chapel is considered Giotto’s masterwork because of the completeness of the decoration and thoroughness of the composition. The Chapel also received a complete restoration several years ago to remove salts that were rising to the surface, to consolidate paint loss, and fix cracks and other structural damage to the chapel. It is brilliant thing to see! I visited in the late morning so there was daylight filtering into the church nave. The red and orange robes had depth and weight. They were soft but with tangible volume and overall just gorgeous. Giotto painted colors by simply varying the amount of pigment used rather than mixing in white or black pigments to darken or lighten. The fullness and movement of the robes comes from this subtle variation in tone of the pigment. 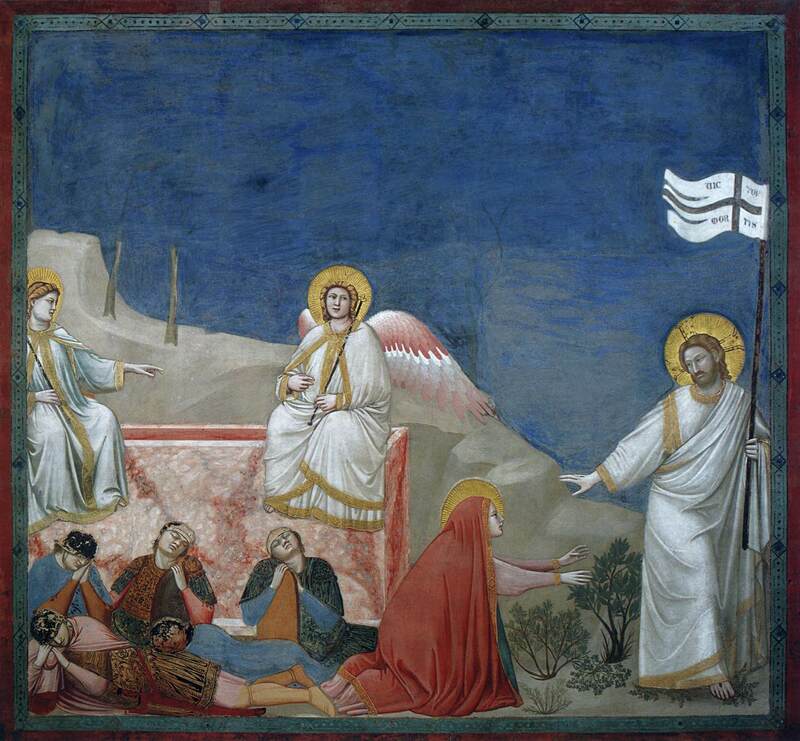 It was masterfully executed by Giotto and expertly revealed by a very successful, modern restoration. Looking at a lot of images of the chapel, the damage (even after restoration) appears too stark and the colors too dark. Sure a lot of this damage still exists but it is really not so pronounced in natural sunlight. In person, the colors breath and blend and soften. It’s as if a camera captures a single frame of something in motion. The photos really are no comparison for seeing the chapel in real life. 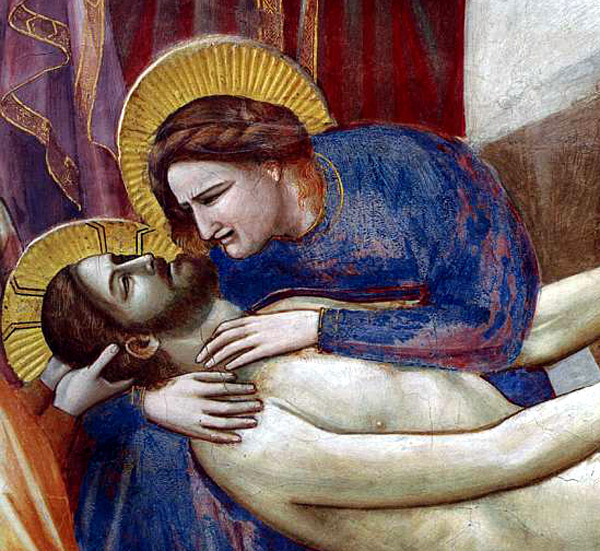 Art history teaches that Giotto was the artistic tipping point that ushered in the Renaissance. While the Byzantine-Gothic formula for depicting figures was starting to crack with his teacher Cimabue, it was Giotto who introduced naturalism back to the visuals arts. 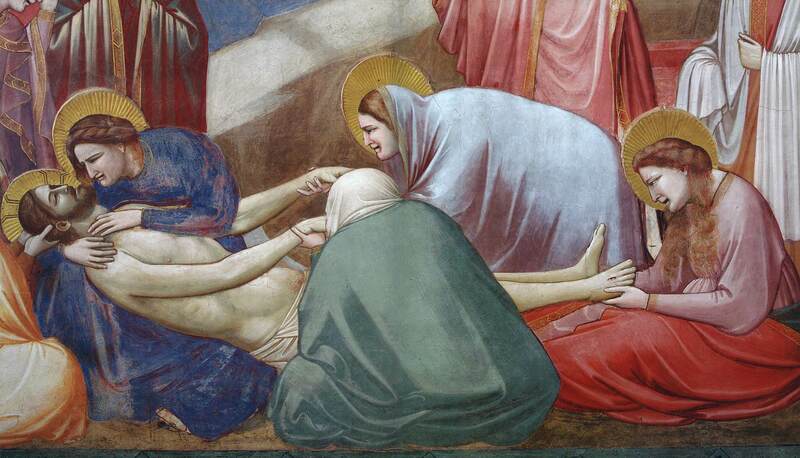 Analysis of Giotto’s work always points to the emotion in his figures, specifically anguish among the lamenting friends around the cross in the Scrovegni Chapel. It’s hard not to appreciate the pain in this scene. Here are furrowed brows, tearful eyes, and twisted mouths which don’t appear in Italian Gothic or Byzantine of the previous century. It is very easy to point to these figures as an example of naturalism and human emotion to art, but I think this misses the true genius of Giotto. He was an artist of subtlety and nuance which was even more radical in an age when Saints held their murder weapons against a golden backdrop. Standing in the Chapel itself, there was another even more dramatic panel that demonstrated a greater depth of human understanding. 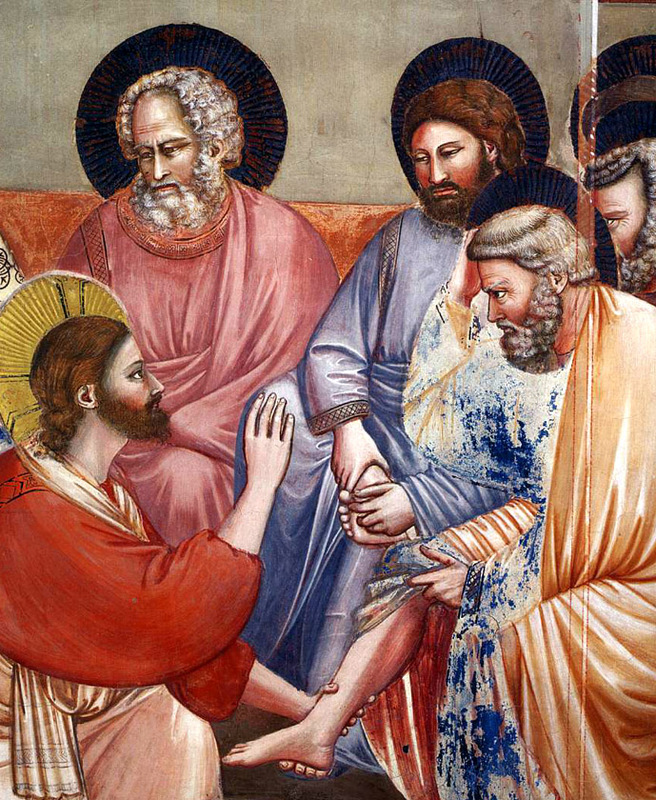 The massive artistic leap forward in the Scrovegni Chapel is a panel that demonstrates true insight into the human psyche: “Scenes from the Life of Christ – Washing of Feet”. Thinking historically to the life of Jesus, one’s feet became incredibly dirty walking around. It was an act of hospitality and humility to wash the feet of others. Before the Passover meal in the Passion story, Jesus told his 12 disciples that he was going to hand-wash their feet. 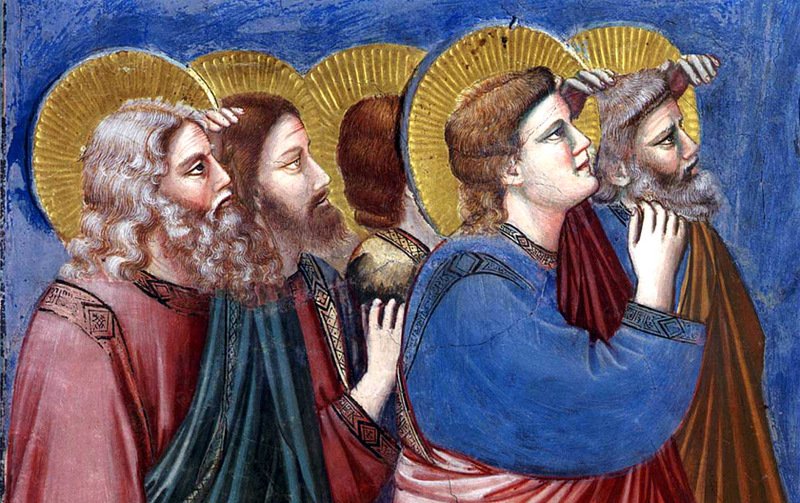 In Giotto’s version, each figure react uniquely to this strange event. Two younger apostles stand to the left of Jesus with water jugs clearly helping the process along; you can just make out a faint smile on one of them. Behind and on the far left, a man with wild gray hair is untying his sandals enthusiastically while the men above him watch with worried expressions. My favorite figures are right around Jesus. 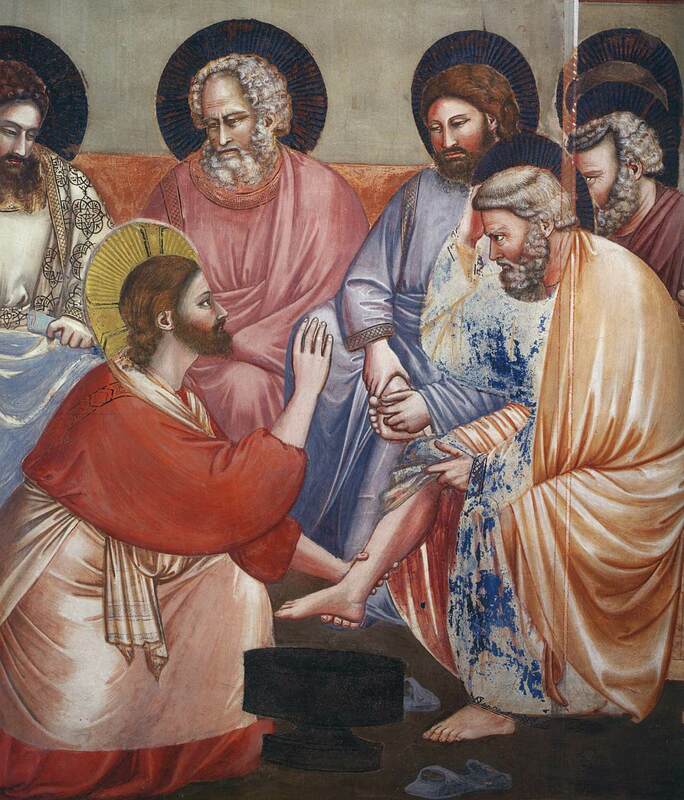 With Peter’s leg in hand, Jesus tries to reassure him. Yet even as he holds up his robe, Peter is literally scratching his head. There is confusion but willingness in his direct stare and furrowed brow. Behind them, the man in blue conceals his bare feet perhaps feeling unworthy or embarrassed and seems to be contemplating what his turn will mean. To his right, the man in purple looks anxiously away. His hands are wrapped in his robe as if to show that he does not want to and will not take off his sandals. Giotto has managed to convey a lot of the emotionally subtle and theologically complex elements in this scene. By comparison, painting someone crying now seems less impressive. The other piece of “naturalism” that made me laugh was in “Scenes from the Life of Christ – Ascension”. Jesus is being taken up to Heaven surrounded in a brilliant halo, and the apostles below are raising their hands to protect their eyes from the light. What an incredibly intuitive detail! This is of course what a human would do in the presence of blinding light and demonstrates a big departure from the gold, semi-divine world of Gothic panel paintings. It’s tough to have a favorite panel, but I definitely left the Scrovegni Chapel with a new appreciation for “Scenes from the Life of Christ – Resurrection.” Based on the Gospel of John, Jesus appears to women weeping at his tomb just after the resurrection. Mary Magdalene recognizes Jesus, calls out to him, and is told not to touch him because it is not yet time. It’s a strange exchange but has become popular in art as the “noli me tangere” or “touch me not” scene. Giotto’s Mary is just incredible. Kneeling, she is almost completed concealed by her red robe. Her little face peers out followed by two jutting, almost disembodied pink arms. 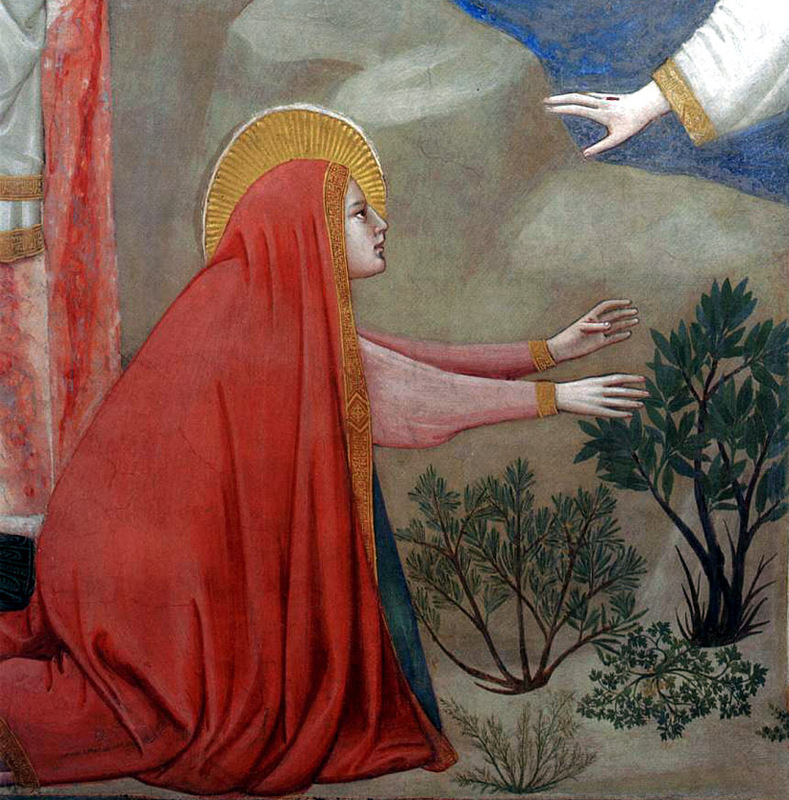 Unlike future noli me tangere Marys who will gesture gracefully for Jesus, Giotto’s Mary is really grasping with desperate, outstretched, and nearly straight arms. Her expression combines disbelief with a wondrous hope; her eyes are locked in on Jesus’s face. Almost as much as Mary is reaching out, Jesus seems to be running away. I only really noticed this in front of the panel, but he is literally out of the frame. Jesus’ arm and the very top of his victory banner are cut off by the edge of the panel. The sharp angle of this right leg makes it look like Jesus is trying to get away – and fast! Even with the urgent getaway, there is a kindness in his face that reminds us of the underlying reunion actually occurring here. Looking at the lay-out, this composition is a huge departure from Gothic art. 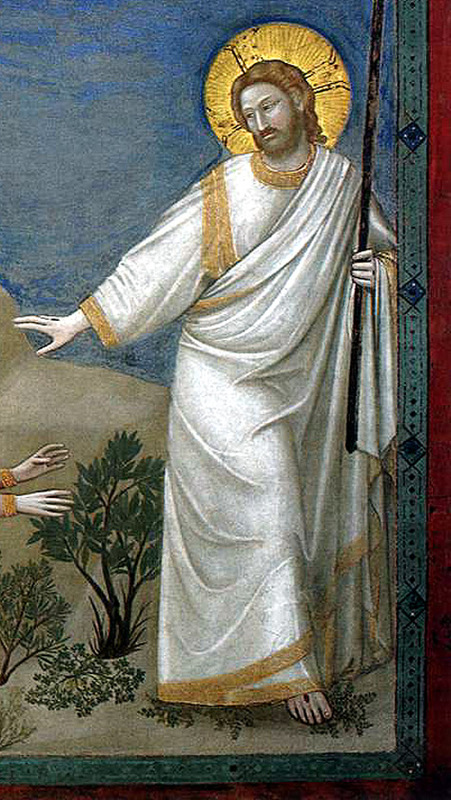 The tense, non-physical interaction between Mary and Jesus only takes up a quarter of the image. They are balanced by sleeping soldier to the left and an empty blue sky above which takes up almost half the painting. It’s a daring lay-out that relegates the action to the corner and intensifies the fleetingness of this chance encounter. It was really exciting to experience this insight and enjoy this painting in person. There are several other details that you only notice when you can walk around the images. For example, the halos are all painted over raised fresco ridges which is a Byzantine convention. This makes for an interesting juxtaposition of traditional art elements and Giotto’s innovative imagery. Alternatively, Judas’ halo loses the ridge and becomes just a painted dark saucer at the beginning of the Passion narrative images. 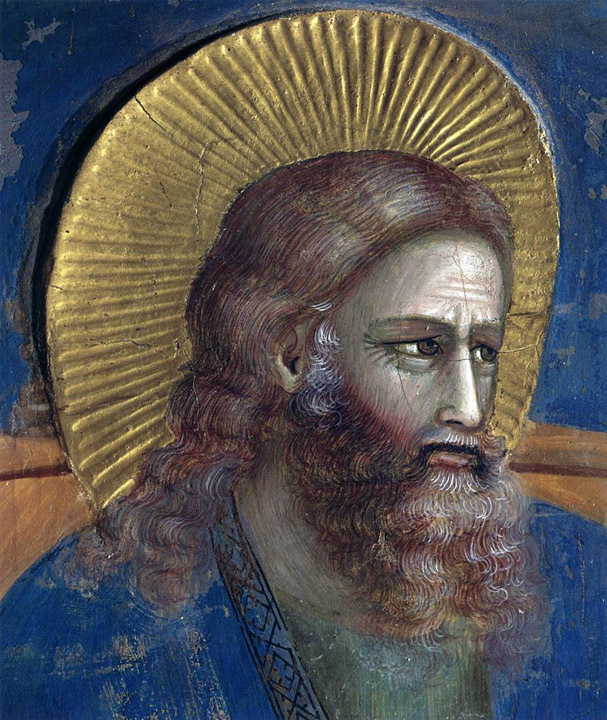 I wonder if Giotto originally intended to remove Judas’ halo but for visual consistency it was added later, or if Giotto always expected to depict Judas with a waning halo leading to the Betrayal? There are also mirrors set into the plaster of Jesus’ halo in the Last Judgement scene on the back wall. Imagine the sunlight hitting that every day and radiating out! I also really liked the goofy camels that look like donkeys in the Nativity and the fat peasants in the Wedding at Cana panel. Viewing the paintings at their real size you can also appreciate the Hieronymus Bosh-like demons torturing the damned in the Last Judgement which include one like monster that I can only describe as “Hell’s Armadillo”. If you find yourself anywhere remotely near Padua, then it’s worth a side trip to visit the Scrovegni Chapel (aka the Arena Chapel). I thought Giotto’s frescoes were more impressive than the Sistine Chapel and the space more breathtaking than many of the greatest churches. Just remember to book your tickets in advance and to stretch your neck out beforehand because you won’t look down for a second. And of course, consider getting at least two sessions because 15 minutes will most definitely not be enough time. GAH! Your making me want to go back today!!! And smart of you booking back to back tickets–we did one in the day and special night session, so we didn’t have a few minutes alone with the masterpiece. At least you got two visits, that’s great! 🙂 How was the light during the night visit? It was so beautiful with natural daylight. I worried that the spot-lights at night would make it look flat and the colors off like you see in most photos of the chapel. Loved this vicarious visit, Christina. I so love Giotto and Cimabue. I wonder what the artists would make of the ‘“environmental equilibration” chamber and video introduction before passing through two air locks’. The passage of time in one space is truly incredible to contemplate. Thanks Lesley! 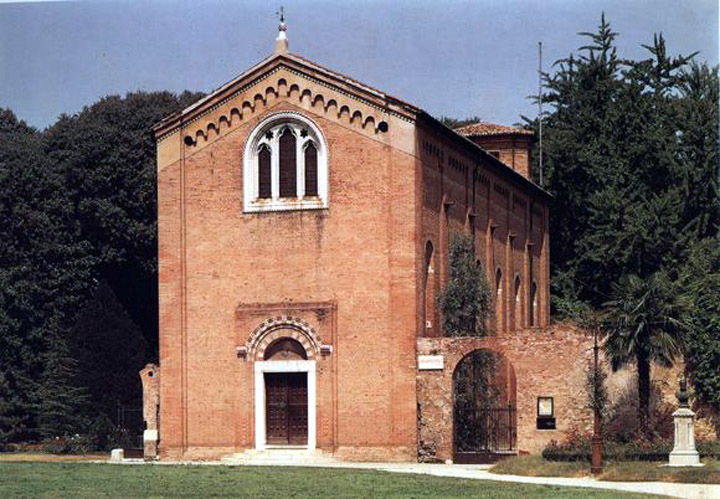 Some of the damage to the chapel was caused by careless human action when the front loggia and palazzo next to the chapel were torn down. Didn’t someone realize that that kind of vibration and heavy construction would crack the frescoes? I think Giotto probably thought it would last forever because of the permanence of the material. Scrovegni must have hoped it would last forever since it was his artistic offering to the church and his funerary chapel. What a superb post, Christina. I liked it very much. Thanks so much Covetotop! I’m glad you liked the post and am even more glad that you got to enjoy the chapel for yourself! (Even if it was only 15min., but now you know for next time.) I actually spent too much time exploring the side streets of Padua and sitting in the gorgeous Prato della Valle that I never made it to Caffè Pedrocchi. Clearly I am a cappuccino novice. 😉 That’s it, I have to go back to Padua soon! Wow, I’d love to spend some time in the Scrovegi Chapel. I think I could probably spend a whole afternoon getting lost in the detail. I will never forget my visit there. I was so glad to have brought my binoculars….in fact you really need them throughout Italy. Wonderful post, Christina. I visited back in 1995 after studying the Scrovegni Chapel as part of my major coursework. My professor was really into Giotto, so we got lots of detailed explanations. It’s the kind of place one just has to see in person. I’m glad you’ve visited! 🙂 It really is a place you have to see in person! It’s cool that you saw it before the restoration. In addition to meaning that you have to go back and see it now, it will be like having a whole new experience because it has changed so much. There we go. A new item for my bucket list. Your description and photos have sparked my imagination! We study Noli Me Tangere in my History of Western Culture class, so I will be directing my students to your apt analysis of the chapel.